Spudsmart | by Justin Miller | January 2017 – Crop producers who struggle with damagingly high soil salinity due to naturally occurring salt deposits, high water tables and/or salt accumulations from manure applications know managing salinity can require intensive effort. Luckily, managing fertilizer-derived salts in soil requires only a basic understanding of soil chemistry, some simple know-how, and balance. High soil salt content increases the osmotic potential (pressure) required for water molecules to move. In practical terms, the higher the salinity, the more difficult it is for seeds and plants to pull the water they need for growth into their cells. Virtually all crops are sensitive to soil salinity. Potato plants fall somewhere in the middle of salt sensitivity: they are about one quarter as tolerant of salt as barley, but about twice as tolerant as dry beans. Potatoes have shallow, relatively inefficient root systems. 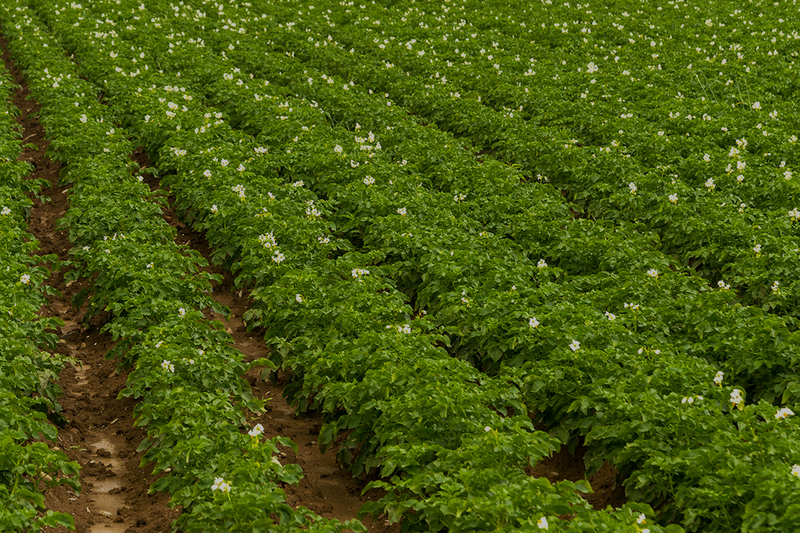 To improve nutrient accessibility and efficiency, many potato producers band-apply rather than broadcast their fertilizers. However, many fertilizers, especially those that are nitrogen and potassium based, can contain high salt levels. High salt fertilizers are designed to dissolve rapidly in soil to provide nutrients to plants quickly. This rapid dissolution causes an almost immediate salt spike in the surrounding soil. When applied in high concentration in or near seed rows, some salt-based fertilizers may suppress germination and/or cause seedling or root injury. At seeding time, potatoes fair better than most crops for tolerance to fertilizer-based salts because seed pieces are large, spaced far apart, and not as sensitive to salinity as other crops. That said, salt injury from fertilizer can – and does – impact potatoes. Most phosphorus fertilizers have relatively low salt indices. Still, because they are often banded in the furrow or near seed, and particularly because they are often blended with nitrogen and potassium-based fertilizers, they must be managed for salt index. Nitrogen, sulfur, calcium and magnesium move fairly easily in soil through a process called mass flow. This mobility means these nutrients can be broadcast or band-applied in relatively large distances from the seed and still produce the desired benefit. Phosphorus and potassium move through soil via diffusion: a slow and limited process. Because diffusion only moves a nutrient a short distance, these nutrients must be applied closer to plant roots for maximum accessibility and efficacy. Fertilizer-derived salt injury can be managed by following several rules. If placing fertilizer directly in the furrow, limit the amount to just what is needed for the crop’s early vegetative growth, and always use the lowest salt index products possible. Band higher-use rates of fertilizer at least two inches beside and two inches below the seeds, especially if the fertilizer contains nitrogen and/or potassium. Finally, keep soil and environmental conditions in mind when making fertilizer decisions: dry and/or sandy soils increase the potential for salt injury to crops, as does cool temperatures. Finally, since the most vital key to management is information, remember to monitor fields for salinity on a regular basis, particularly in western provinces and states where saline soils are common.